Welcome to my blog. My blog is mainly for the sharing of the many projects I make either for swaps, for gifts or just because I was inspired by something I saw on the internet and wanted to give it a try as well. I hope you enjoy what you see and if you have any questions be sure to send me a comment. 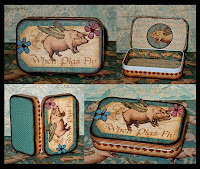 Another altered tin using Graphic 45's When Pigs Fly paper from their Ye Olde Curiosity Shoppe paper line. I've gotten a lot of positive feed back on the tins. I think I'm going to enter them in the W. Washington State Fair, maybe in a recycled category. I sure have fun making them. Not at all... I am happy to inspire others to create. Married since 1974, 3 sons and 2 daughters. Nana to 9 grandsons with our first granddaughter born the end of April 2016. Love to travel with my family. Enjoy photography, scrapbooking digital or hands on. Love altered arts / mixed media of all kinds. I love spending time with my family. My latest mint tin creation.